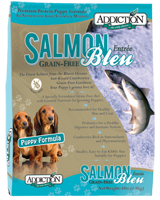 Formulated with New Zealand King Salmon from the bluest oceans, Addiction's Salmon Bleu Puppy Formula is a grain-free diet with an optimal balance of essential nutrients, specially tailored for the unique nutritional needs of active puppies. High in Omega 3 fatty acids and natural antioxidants, this premium grain-free diet with vegetables and fruits makes a delicious, gourmet meal for your puppy in a smaller, easy-to-eat kibble size. 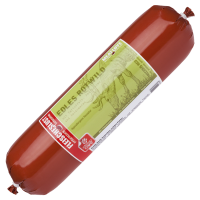 Ingredients: Salmon Meal, Dried Potatoes, Dried Tapioca, Chicken Fat, Peas, Dried Kelp, Dried Cranberries, Dried Blueberries, Dried Spinach, Brewers Dried Yeast, Ground Flaxseed, Dried Enterococcus Faecium, Dried Lactobacillus Acidophilus, Dried Bifidobacterium Longum, Dried Bifidobacterium Thermophilum, Sodium Chloride, Vitamin E Supplement, Niacin (Vitamin B3), Calcium Pantothenate (Vitamin B5), Vitamin A Supplement, Thiamine Mononitrate (Vitamin B1), Riboflavin Supplement, Pyridoxine Hydrochloride (Vitamin B6), Vitamin B12 Supplement , Vitamin D3 Supplement, Folic Acid (Vitamin B9), Taurine, Sodium Chloride, Choline Chloride, Magnesium Sulfate, Zinc Sulfate, Ferrous Sulfate, Calcium Carbonate, Copper Sulfate, Manganese Sulfate, Calcium Iodate, Cobalt Sulfate, Sodium Selenite, Green Tea Extract, Rosemary Extract and Spearmint Extract.